Iphone photo cause I didn’t have time for the “nice” camera! Latin Inspired Brisket is really just my interpretation. 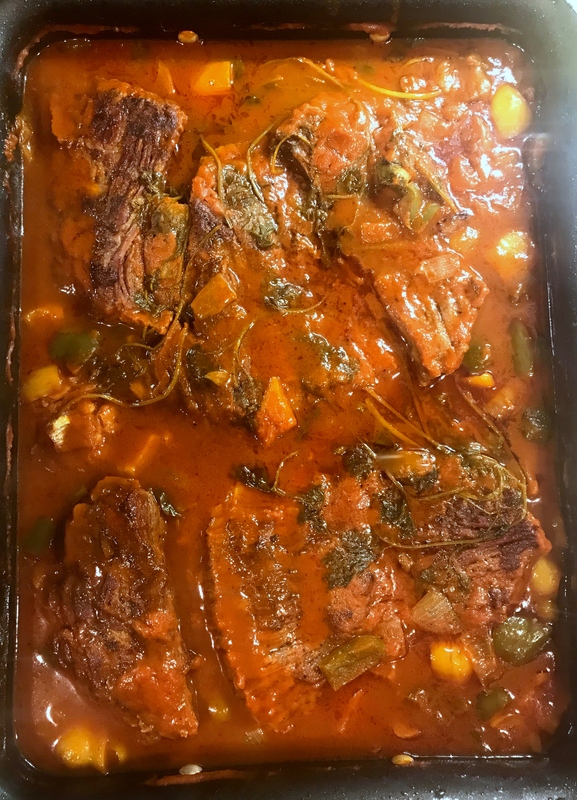 In essence, this is just a traditional braise, using ingredients that are traditionally used in Latin American cooking: onions, garlic, peppers, tomatoes, cilantro, cumin. You may see many of my “Latin” recipes repeat a lot of these ingredients; but it is what gives it that unique flavor! This may seem like a lot of steps, but it’s WORTH IT! Please keep in mind that when the recipe (any recipe) calls for “fork tender” you literally want to stick a fork in it. A knife will pierce through most meat and is not a clear indication of doneness. I did an instagram takeover of Kettle and Cord’s instagram, and I saved the video so you can see how I made this delectable brisket! Let me know if you have any questions! Season your brisket liberally with the salt, granulated garlic, cumin and coriander. Rub generously into the meat. Set aside. In a large pan (preferrably stainless steel or cast iron) start browning both sides of all the meat in the olive oil. Work in batches if you need. You want a DEEP golden hue. Set aside on a plate or platter to collect any juices. Next, on low heat, saute the onions, celery and peppers in the fat that remains in the pan; and be sure to scrape up any brown bits. After they have softened a bit and onions are translucent, add the saffron strands and mix throughout. Preheat oven to 350 F at this point. Add the tomato paste, and cook for about 3 minutes, stirring continuously. Then add the vinegar, tomato sauce, water. When that comes up to a bubble; add brisket back in with any juices, garlic, olives and cilantro. Cover very tightly with aluminum foil. (Double layers if the aluminum foil is thin) and braise in the oven until a fork slides easily in and out of meat. About 2 hours. Once brisket is tender, remove from pan. Squeeze the garlic out of skin and mix into sauce. Then, pass the sauce through a fine mesh sieve (strainer) to strain all the chunky stuff and you have a smooth, flavorful sauce. You can either slice (AGAINST THE GRAIN) and serve it in the sauce, or let it cool and freeze the brisket whole in the sauce and then slice, and reheat in the sauce when serving.